Vandala Magazine is looking for casual to full-time journalists, bloggers, and photographers that are music lovers in North America. We are looking for people who want to interview bands (possible cover interviews), review music, and attend concerts/festivals, casually to regular bases. We are looking for all genres other than metal as we have many metalheads already. Areas we would love to see the most are interviews, reviews, exclusive premiere reviews and daily website posts such as live music and festival coverage. If you are interested in being considered for an un-paid position with the magazine. (Media Accreditation for concerts and festivals is provided), please fill out this form HERE . Details of each position below. 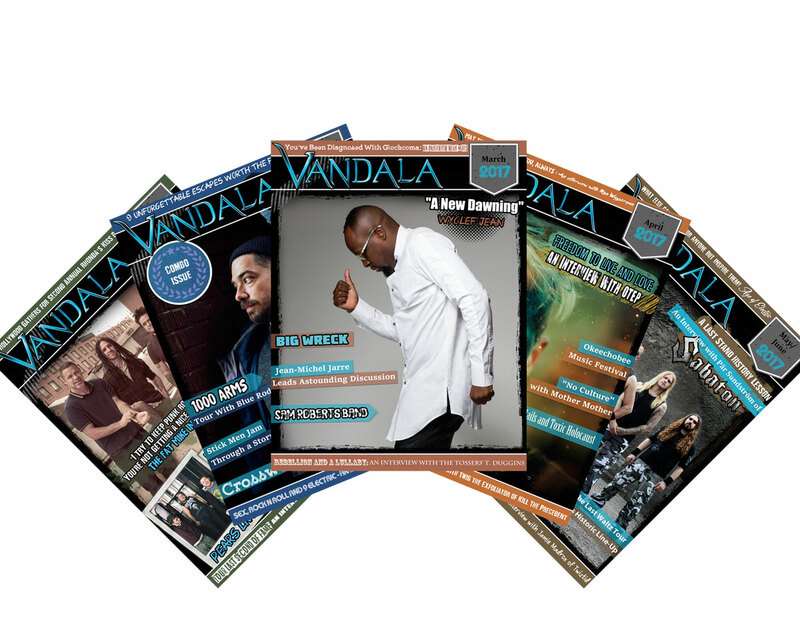 * Please note that for the moment, Vandala Magazine does not turn a profit and as such our staff works without monetary remuneration; however, compensation is available in the form of press passes, show access, festival access, band material etc. If we like your work we do write great reference letters and can be used as a reference. Job Description: Keep up to date on music announcements and post your own short pieces on the latest news. Unless it is a huge topic we do not expect more than a couple of paragraphs per submission. – Review passes are offered in exchange for a show review (one review pass is usually granted). – Festivals are limited space! Photojournalists tend to take the spots at festivals where we are allowed only one pass, some festivals do allow press to have a writer and photographer. – Interviews, concerts, festivals are requested through the editor-in-chief and once approved you are granted access as media. Phone interviews are also conducted. – All albums are watermarked thus no sharing. – Must possess strong English skills, oral & written, in order to complete the interview as well as transcript or other articles. – Should be open to various genres of music to have more options for shows and albums. If not that is okay! – List of your show requests, albums (if you do not see it in the inbox), festivals interviews etc are to be emailed to editor-in-chief regularly. We are looking to feature photo(s) and photographers of live music artists and music events to feature in Vandala Magazine and website. Be it just one great shot you want to send us or you want to be a regular photographer. – Photo passes are offered in exchange for a photos (one review pass). – Should be open to various genres of music to have more options for shows. – List of your show requests to be emailed to editor-in-chief regularly. – Photographer retains all copyright and ownership of any photo submitted to Vandala Magazine and Vandala Concepts. – Your watermark/logo and all contact info with links need to be on file or submitted each time. This is so we can link, tag and give credit. – Please use drop box or file sharing system. – Photo Gear list. This is for when agents, labels and promoters ask. – Unedited Photo, no photo manipulation – Basic adjustments may be permitted. Meaning do not send us stylized photos. This is editorial and they just don’t work. – Photos must be embedded with your own copyright notice, and/or watermark, DO NOT take away from the photo. – Images a Minimum 300DPI or higher. – Images are to be taken with a DSLR Camera ONLY. – Tell Us about the photo – Artist, (member of group if possible), date, location (city, province/state, country etc) Venue and Short sentence about the event or shot. – NO Pornographic or offensive photos PERIOD! – For photograph submissions photos have to be within the last 2 months. For Photographer features photos can be within the last 6 months. – Include your name, city, country, phone, email. If you also have any of the following please include – company name, website and/or link to biography (if you have one).